Sundays are ‘Anything Goes’ days. If I’ve got something to write, I will. If I need a break, I’ll take it. If I just want to post a bunch of pictures or a YouTube video, I will. Today, I will write a good old-fashioned post. 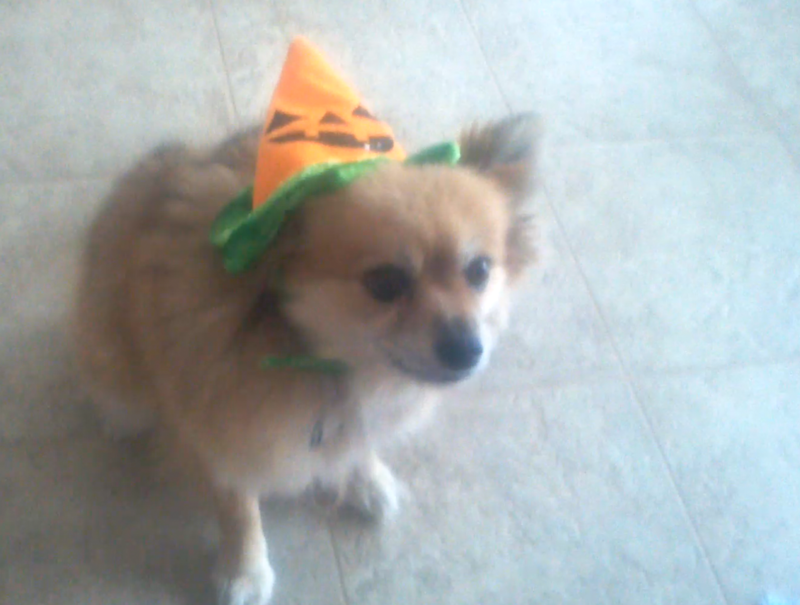 Foxy, our rescue, in her Halloween hat. I’m not entirely sure how some of my friendships form. First we just sort of know each other. Then it gets to the point where we see each other on a path, each make a face at the other, stop right in front of each other, one of us pats the other on the head with a binder as they say, “Boop!” and then we continue on our way, calling “‘Morning!” over our shoulders. Between that and first finding out their name, I have no idea what happens that somehow gets us from point A to point B.
I’m feeling a little bit homesick today. Actually, it might be homesickness and a mix of just wanting to be done with all this work. I don’t get homesick very often. I went my entire first year without being homesick, but I guess it was bound to happen eventually. And it’s better for it to happen five days before I leave than a month or two ago, right? There are three things I especially miss: My little brother, my dog, and my room. I mean, my room here is nice and all–I even decorated it for Christmas!–but my room back home is still unfinished since moving in over the summer and there’s so much I want to change! My dog is basically a big furry teddy bear that licks your face and poops but is always happy to see you no matter what. Who wouldn’t miss that? My brother…I don’t know. I just miss him. 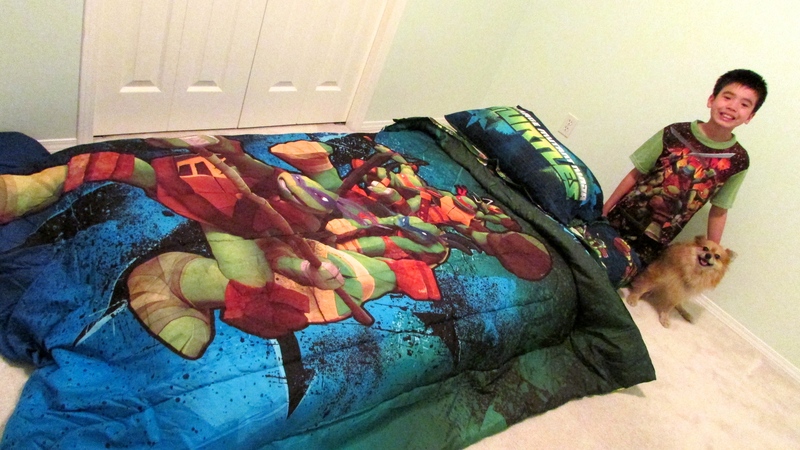 He’s ten and he likes Ninja Turtles. My brother, my dog Foxy, and my brother’s Ninja Turtle bed that my dad and I got him over the summer. He was so excited about it. Anyway, I should get back to working on this Research Portfolio thing. I’m still not done and it’s due tomorrow. So much for getting a head start. The thing is, I’ve never actually done anything quite like this before. Compiling research into a plan for a story I haven’t written yet is so far out of my comfort zone I might as well be in the middle of the Pacific. I was told I could cover everything in point form but I also have to make it engaging. How do I make point-form engaging? Is it even possible? I suppose I’ll find out soon enough. Tomorrow this will all be over…except for my film script. That one’s due Friday. In terms of my assignments, I’m feeling a little overwhelmed at the moment. I always have a day like this when I don’t know what to do or how to start, although it usually comes along a lot closer to the deadlines. I suppose I should consider myself lucky, then? To get over this sense of dread and inevitable failure, I’ll do what I walkways do: eat candy and watch funny internet videos. Oh, and I’ll break down my work into manageable chunks and work little-by-little (she typed as she remembered that her dad reads this blog). The Christmas Showcase is over, and it was lots of fun. It is time to turn my attention to all my assignments that are due by the end of this week.